The Taste of Chicago……….sleep so good. I love Chicago. Everything about this metropolis is totally inviting. Recently I along with some of my closest friends took on Chicago during the famous “Taste”. 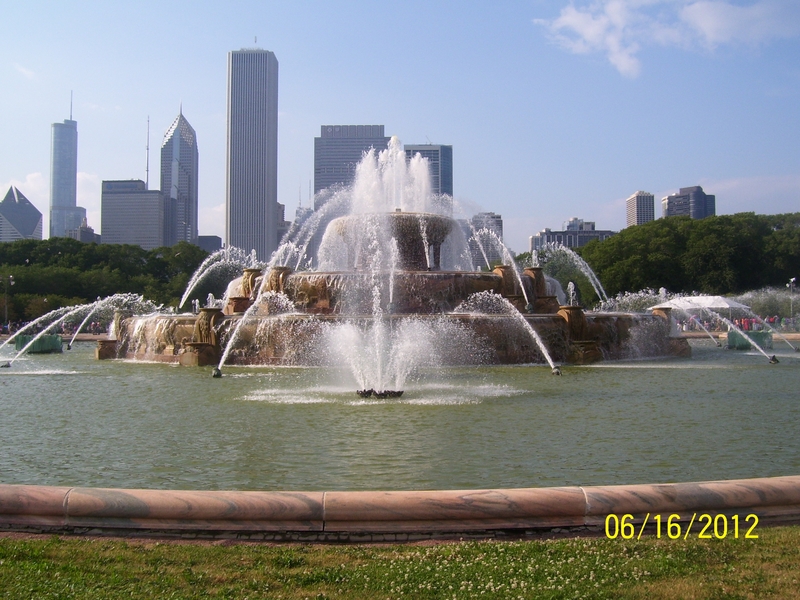 There are a few important choices to make if you are vacationing in Chicago. Choice number 1: Which of the many magnificent hotels you will lodge. Choice number 2: Of the many amazing restaurants, which few are a must to visit. Choice number 3: Too many historic locations to visit. Now the really cool thing about Chicago is that of these three choices, you can almost throw a dart and be guaranteed a great trip. When planning my trip I did not however throw that dart. As I have spent countless long weekends in the Windy City, I was a little more deliberate in my selection. I decided to bed in the west suburban city of Rosemont. The plan was to take the Blue line from Rosemont into the city daily. Normally we bed in downtown at one of the four or five-star hotels(I’m not rich just a smart consumer). Now these hotels have location hands down. You can access all the major museums, all the pro sports venues, too many restaurants to name, and the nightlife is amazing. Some of the challenges are parking is sky-high(all big cities follow suite), the wait for any of the eateries is 1 hour or more, and it usually takes forever to check in to your hotel. Don’t get me wrong, I LOVE CHICAGO. I know when I go downtown to eat I’m going to wait for an hour at least before I sit down. For me, the challenges are part of the adventure. Knowing this, if you’ve never been to a monster sized city you will be faced with these challenges. Anyway, we bedded in Rosemont. The hotel/resort we stayed in was a very nice hotel/resort. We were greeted with a warm formal introduction by the concierge. He welcomed us to his hotel/resort and asked if we needed help with our luggage. I proceeded to check in while the rest of the group helped with the luggage. When I go to check in I was greeted with a smile and was made to feel comfortable. During the check in process, I was engaged with small talk and was asked what was on our agenda for our weekend. I mentioned that I was starving and then was offered a paper menu from the restaurant in the lobby and was also given a list of some of the local eateries. I love local eateries in the Chicago area. As the check in process was coming to an end I asked for a complimentary upgraded room(be careful what you ask for, you may just get it). The CSR informed me that the hotel/resort was completely booked for the weekend; however, she could put me in a corner suite with more square footage and a better view. Of course I accepted and thanked her. Our suite was very spacious. It had a sitting area with a love seat, a coffee table, a desk, and a magnificent view. Also it was at the end of the hall. Quiet and very secluded. We stayed for two nights. For breakfast we had a good amount of choice. We could have a nice breakfast in bed, we could have a five-star breakfast experience in the restaurant, or we could get bagels and cream cheese in the cafe. We chose the cafe as we were saving room for the “Taste”. One of the surprises was that there was a casino in Rosemont in walking distance from our hotel. And even cooler, there was a free shuttle bus from the train station. We went to the casino for entertainment but I didn’t win any money. I never do. The casino always wins. Don’t go to casino’s to make money. Go to casino’s for the entertainment. Back to my hotel/resort. As we went to check out the CSR asked how our stay was and I informed her that we had a great time and would definitely bed there again. We checked out and headed to the van to shove off. However, we never paid for parking. So I rolled back to the desk to pay for parking so we could be on our way. When I arrived at the front desk and told the CSR that we needed to pay for parking she took my ticket validated it and told me it was on the house. I was blown away. She basically saved us in excess of $75 for parking. AMAZING! Overall my stay was great. I didn’t come across one issue until I arrived home. The issue didn’t have a thing to do with the hotel/resort. It was my fault totally. As I was unpacking, I realized I had left my toiletries in the hotel room. I was kicking myself, kicking myself, kicking myself. I left my crazy expensive toothbrush, some of my favorite cologne, and my grooming kit. I was totally bummed that I forgot my toiletries. I couldn’t let it go. I had to get my belongings. On Tuesday morning I called the hotel and informed them of my belongings being left in the room. They tracked down my things and told me they would send them to the shipping department. I would be called to verify my address and shipping preferences. Now I was feeling good that I would eventually get my things. However, I never got a call. Wednesday came and went no call. I was being very patient because this situation was totally my fault. On Thursday lo and behold my package arrives. Unbelievable! Due to my absent-mindedness I left some belongings in my hotel room, and in less than a week I had them back in my possessions on the hotels dime. This customer service was far above and extremely beyond normal. Just to put it into perspective, during one of my many trips to Vegas I was gifted $1000+ worth of gifts from vendors. These gifts were stolen from my room by the housekeeping staff. I did get a tour of the back house of one of the more famous casinos; however, I never recovered my gifts. But my Rosemont hotel/resort made me whole in less than a week. My hat is off to the folks at the Westin O’hare in Rosemont, Illinois. You made my stay a very memorable one. I will definitely be back. Table for Two? or maybe THREE! The Taste of Chicago………….. Eating good too! Hometown Heroes……. Definitely under appreciated: Three reasons why they deserve appreciation.